Any GHS student that needs a winter jacket can stop by the administration building. REMINDER: Students are to wear their IDs at all times. You MUST have your ID to purchase a lunch in the cafeteria. If you forget your ID you can get one at the Welcome Center for $1. If you need a lanyard they are $1, or we can provide string for free. Marine Biology seminars begin on Monday evening, March 13th and continue on Saturday mornings and Monday evenings until the Marine Biology trip. All Monday evening meetings are from 7:00-9:00 p.m. and all Saturday morning meetings are from 8:00 a.m.-12:00 p.m. Your attendance at these meetings is expected! Conflicts need to be worked out ahead of time. See the Weavers if you have questions. IHSAA Student-Athlete Tip of the Week: This is boys basketball sectional week. Past history says it’s a week of surprises. Will we have a snowstorm? What ranked team will be the first out? What school will provide the biggest shock of the week? Is your school a favorite or the underdog to take the sectional crown? There is nothing more fun than participating in an event that the whole school gets behind. Whether it’s a school play, a choral event or a team advancing along in a state tournament, it’s fun to be involved as the excitement grows and the event arrives. As a member of your student body, make it a point to get involved in the week’s festivities. The support shown by the students might make a difference in the outcome of that close game. History could be made and the memories from those exciting games could be something that you remember and talk about fifty years later! You can sign-up for Intramural Volleyball through Thursday. The cost is $8, or $3 if you have played Intramurals this year and do not want a new shirt. For more information and/or to get forms see Mr. Wolf in 2150 or Mr. Lucas Kauffman. Registration forms can also be picked up from the main office or the athletic office, but must be turned in to the Intramural directors. Seniors: If you still need to order a cap and gown you can visit their web site at www.highschool.herffjones.com to place an order. Cap & Gown delivery day will be on May 2nd during SRT. Three C’s Memorial Scholarship – general scholarship for students who have completed at least 6 athletic seasons as an athlete, trainer, manager, cheerleader, etc. Homework help is available every Tuesday and Thursday in the media center from 3:45-5:00 p.m. A bus will be available around 5:20 p.m. if you need a ride home. It will pick you up at door M. This is a great opportunity if you just need a little extra time or even just a quiet place to do your homework at the end of the day. The Goshen Band Boosters are hosting a shoe drive through April 9th and would love your help! They’re collecting gently used or new shoes which are then taken to other countries such as Haiti and given to micro-entrepreneurs. The entrepreneurs refurbish the shoes into usable ones or other items of use and sell them to earn an income to help themselves and their families. Take a look in your closets or wherever you may keep your shoes and see if you have a pair or two that you would be willing to donate. You can even donate flip flops. Bins will be placed around the school (as well as the Goshen area) that have a poster on them with the dos and don’ts of what is an acceptable shoe. If you would like more information, or have any questions please feel free to contact Kristy Nissley at nissley1998@gmail.com. Thank you for your help! Any girl who is interested in trying out for the GHS softball program needs to complete all athletic paper work before coming to open field workouts. The open field schedule is posted on the Goshen Softball website. Tryouts will officially begin on March 6th. If you have any questions contact Coach Kulp. We hope to see you there! Go Hawks! All freshmen who went on the DC trip last summer should stop the main office this week to pick up your group photo from the trip. Super Mileage will meet TODAY at 7:00 a.m. and 3:40 p.m.
Football off-season workouts are under way! If you are planning on playing football in the fall and are not in a winter sport, you are expected to be there. We will be done before 5:00 p.m. Now is the time when you make your biggest gains. Brick by Brick! There will be a football call out meeting TODAY for any boy wanting to play football next year during the 2nd session of SRT in the main gym. Please plan to attend as we will be discussing our Lift-a-Thon and other items. Please contact Coach Park if you won’t be able to attend. Key Club will meet in the cafeteria on Thursday during the 2nd session of SRT. The boys varsity basketball team will compete in sectionals at Northside Gym vs. Concord at 7:00 p.m. Go RedHawks! Congratulations to the GHS Winter Guards on their fabulous performances at Carroll High School on Saturday! The JV Winter Guard received a gold rating and the varsity was 2nd place in their class. On Saturday, the Goshen Orchestras performed at the State Solo & Ensemble in Indy. With 20 solos and 17 ensembles, all students earned a gold or silver with the Camerata Chamber Orchestra earning a perfect score. Congratulations on all the practicing resulting in beautiful music! Sign-ups for Intramural Volleyball begin today and go through Thursday. The cost is $8, or $3 if you have played Intramurals this year and do not want a new shirt. For more information and/or to get forms see Mr. Wolf in 2150 or Mr. Lucas Kauffman. Registration forms can also be picked up from the main office or the athletic office, but must be turned in to the Intramural directors. Come support the girls tennis team by eating at Culver’s restaurant TONIGHT between 5-8:00 p.m. The players will deliver your food and clear your table, and in return Culver’s donates a portion of all sales that evening to help offset apparel costs. Super Mileage will meet TOMORROW at 7:00 a.m. and 3:40 p.m. There will be a football call out meeting TOMORROW for any boy wanting to play football next year during the 2nd session of SRT in the main gym. Please plan to attend as we will be discussing our Lift-a-Thon and other items. Please contact Coach Park if you won’t be able to attend. The boys JV basketball team finished the season with a 16-6 record by winning at home against Manchester. The RedHawks were led in scoring by Dominick Swinney with eleven, followed by Brockton Yoder and Ben Bontrager-Singer each with ten. Eric Newell added seven, Joseph Good five and Porter Revoir four. Philip Wertz, Wes Beck and Ryan Harmelink chipped in three apiece. Yoder also led the team in rebounds with seven and assists with six. Solid 2nd half team defense was the key to the win against a good Manchester team. Congrats on an outstanding season! The varsity boys basketball team closed the regular season with a home win against the Manchester Squires. The RedHawks had a balanced scoring attack with Mitchell Walters scoring twelve points, CJ Detweiler and Will Line each adding eleven and Bryant Robinson contributing ten. Michael Pinarski also scored nine and Eliot Nafziger five. Detweiler grabbed nine rebounds and Walters six to lead the Hawks. Line and Walters each dished out four assists. The team’s next game is tomorrow at 7:00 p.m. at Northside Gym vs. Concord. This is the opening game of the Elkhart Sectional. On Thursday, Feb. 23, on an unseasonably warm day, the IB (International Baccalaureate) students from Goshen High School stood outside, anxiously awaiting their friends and fellow IB students from the Flint Southwestern Academy in Flint, MI. The two groups first met last year when the GHS students traveled to Flint for a visit. Part of a full IB education is Creativity, Activity, Service (CAS), which are essential elements that every student must complete as part of the Diploma Programme (DP). As part of their commitment to service, the GHS IB students took a look at the water crisis in Flint, and wondered how they could help. They contacted the IB students at Flint Southwestern Academy, and learned that through many generous donations, they did not really need more water; what they needed was a way to recycle all of the empty bottles. The GHS students took that information and ran with it. They secured barrels to use for recycling from the Goshen Waste Water Treatment Plant, they worked with the GHS construction class to get the tops cut off of the barrels, they contacted the local Coca-Cola distributor to get lids for the barrels, and they spent hours and hours painting and personalizing the barrels for Flint Southwestern Academy. In a collective effort on the project, they also received help from the City of Goshen, other local businesses, and parents. When the GHS students visited Flint last year, they received school shirts from their hosts. Many of the GHS students were wearing the Flint shirts when the bus pulled up in front of GHS on Feb. 23. According to a Flint student who was not involved in last year’s visit, “I was so excited when we pulled up, and I saw them wearing our shirts! It meant so much to me.” The GHS students held welcoming signs for their friends to the north, and there were cheers and hugs as the teachers and students joined the GHS contingency. Everyone made their way to the media center, where they were welcomed by IB coordinator Theresa Collins and one of the GHS students. And then, the students were further welcomed with a popular northern Indiana treat, Rise and Roll donuts, courtesy of IB teacher Carl Weaver. Sherry, Flint Southwestern Academy IB coordinator- Sherry explained that the connection between the schools grew after GHS reached out to Flint about the water crisis. “They brought us the recycling bins, and it was so special because they looked into our school, and decorated them just for us.” She stated that it is good for the Flint students to meet with students from another IB school, “to see that they are taking the same classes, and facing the same assessments and challenges of an IB education.” She added that she would like to keep the partnership between the schools going year after year, because it is a valuable connection for both schools. Following the games and interviews outside, the groups went back to the media center, where they welcomed student leaders from West Goshen Elementary, who are now in the candidacy phase of Primary Years IB. The West Goshen students brought a mixer/game with them for all of the students, centered on the attributes of the IB Learner Profile, which states “As IB learners we strive to be: Inquirers, Knowledgeable, Thinkers, Communicators, Principled, Open-Minded, Caring, Risk-Takers, Balanced, and Reflective.” The students split into three groups (which deliberately included students from all three schools), and then drew pieces of paper out of a bag. In each bag were the learner profile attributes, the definition of each attribute, and an example of each attribute. The students were instructed to talk to each other in their groups, and bring together the attribute, its definition, and an example of the attribute. Following the West Goshen game, the students spread out to table groups (again with students from each school), and held a book sharing, led by the students from Flint Southwestern Academy. Flint students read passages from many different books, and then the students discussed learner profile traits that were exhibited in the book passages. GHS students led the same table groups in a learner profile banner activity, in which each table chose an attribute and wrote something about the attribute and decorated their piece of paper. The GHS students gathered the papers at the end of the activity, and will eventually scan them all to make IB banners for each of the schools. Theresa Collins, GHS IB coordinator- Theresa shared about how the IB TOK (Theory of Knowledge) class reached out to Flint as part of their educational service component, and the “kids just took it from there. It has been a really, really neat experience. 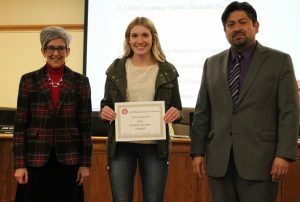 When I retire, this CAS project with Flint, and all of the good that came out of it will be somewhere on my list of most significant memories from my teaching career.” She added that she keeps in touch with the teachers and IB coordinator from Flint, and hopes to continue the visits in the years to come. 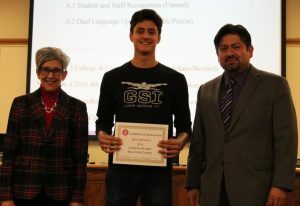 Mitchell, GHS student- He traveled to Flint with the GHS group last year, and said that it was a great experience to deliver the recycling bins and connect with the students. He said that some of the students from both schools have kept in touch through social media. At the end of the table work, the West Goshen students shared “spirit sticks” with their tablemates. Spirit sticks are what West Goshen students earn when a staff member recognizes that they are displaying one of the learner profile attributes; the sticks can be worn on lanyards or put on backpacks. There were a lot of risk-taker spirit sticks given out, as some of the students acknowledged that interacting with so many new people can be scary sometimes! 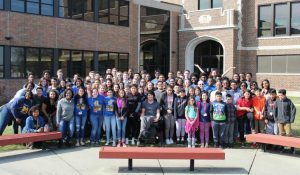 Before the West Goshen students left to return to their school, the students from all three schools went out to the courtyard and took a group picture. One photo had students simply standing still, and one showed them holding up their spirit sticks. In the first picture, you will notice a student in the back row with her face lifted up and her arms thrown up in apparent joy. Her posture alone could probably encapsulate the feelings of the day from most of the participants; it was simply positive, positive, positive! After the pictures, the students had lunch together in the library, and heard a few words of welcome from Goshen’s Mayor, Jeremy Stutsman. He thanked the Flint Southwestern students for coming to Goshen, and let them know that the citizens of Goshen still think of them often and wish them well as their city recovers from their crisis. He stated that their situation has prompted many mayors across the country to work proactively to check water supplies and keep them safe for their citizens. He welcomed the students and educators to return to Goshen any time. After lunch, GHS students led small groups of Flint students on tours throughout the school. The students checked out classrooms, the cafeteria, the auditorium, the construction technology shop, the weight room, and they also dropped in to see choir and jazz band students in action. When the tours were done, it was time for GHS coordinators and students to thank their visitors for coming to GHS, to say goodbye, and to pass out Goshen RedHawks shirts to their friends from Flint. 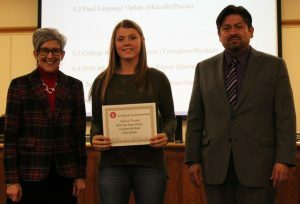 It takes dedication and commitment to earn an IB diploma, but it can be made easier by sharing the experience with someone who understands what it takes. THANK YOU to our friends from Flint Southwestern Academy who came to GHS to play games, to eat together, to talk about common struggles and insights that come with an IB education, to set an example for younger IB students, and to increase everyone’s faith in humanity. Until next time. The boys sectional basketball tournament is next week at NorthSide Gym. The Goshen boys play at 7:00 p.m. on Tuesday, February 28th vs. Concord. After a big win, we would then play Elkhart Memorial at 6:00 p.m. on Friday, March 3rd. With a victory over Memorial, we would play in the championship at 7:00 p.m. on Saturday. Tournament tickets can be purchased from 7:30 a.m. to 4:00 p.m. in the athletic office this week only. Single game lower arena Goshen tickets can be purchased at Northside on game nights at Gates 1 and 3. The boys basketball plays Manchester TOMORROW for the final home game of the season. We will also celebrate Champions Together by introducing the Unified Track & Field team, as well as our guest basketball players from Special Olympics Indiana. Please attend to witness GHS receive their Champions Together banner at halftime of the varsity game. At the end of halftime, all students will get two slices of pizza from the Student Athletic Council for Fan Appreciation Night! To take advantage of this beautiful weather in February, the Ultimate Frisbee Club will be playing TODAY right after school on the administration field. You need forms on file before you can participate. You can get the required forms from Mr. Brubaker, Mr. Snyder or Mr. Lucas Kauffman. Key Club will be volunteering at the Feed the Children Distribution Center in Elkhart on Saturday, February 25th from 10:00 a.m. to noon. Volunteers must bring their signed paperwork, and should check their email for additional details. Contact Mrs. Dillman if you have any questions. Thank you for your service! The Ultimate Frisbee Club and Key Club will be selling RedHawks bumper stickers during tomorrow’s boys basketball game at GHS. Stickers are weather-proof and removable, and are just $4 each! Any GHS PE student who went swimming the past two weeks should consider checking the lost and found swimming basket at the welcome desk. All lost and found items will remain at GHS for only one week. Join us TOMORROW from 6-8:00 p.m. in the media center for financial aid information in Spanish. We will cover the FAFSA, scholarships from La Casa and hear testimonies from college students and community members. Dinner will be served! Come find out how you can apply for financial help for college. Come support the girls tennis team by eating at Culver’s restaurant on Monday, February 27th between 5-8:00 p.m. The players will deliver your food and clear your table, and in return Culver’s donates a portion of all sales that evening to help offset apparel costs. Please join us for a college visit to Ivy Tech in Elkhart on March 10th! This is first come, first serve as space is limited. Priority will be given to upperclassman. See Ms. Gomez (2370) or Mrs. Stamatovich (JAG) to pick up and turn in permission slips. Permission slips are due TOMORROW! Super Mileage will meet at 7:00 a.m. and 3:40 p.m. on February 28th. There will be a call out meeting TODAY during the 2nd session of SRT in room 1450 for anybody interested in IB or AP ART next year. Please attend to see what you could do. Students do NOT need to be planning to pursue a future in art to be in these classes. They are for all students who would like to take our top art classes at GHS for college credit. There will be a football call out meeting for any boy wanting to play football next year on Tuesday, February 28th during the 2nd session of SRT in the main gym. Please plan to attend as we will be discussing our Lift-a-Thon and other items. Please contact Coach Park if you won’t be able to attend. Goshen Community Schools has determined a “silent auction” will be held so community members will have first opportunity to purchase Redskin memorabilia items that the school will not be keeping. The auction will include pieces of the original main gym floor, uniforms, and warm ups. The Redskin auction will begin on Friday, February 24th with a silent auction held during the JV and Varsity boys basketball game against Manchester High School. The silent auction will take place in the GHS cafeteria starting at 5 PM and concluding for that day at 9:30 PM. On Saturday, February 25th, the silent auction will resume from 8 AM – 1 PM in the commons by the athletic office. On Saturday, enter at door M or door B. At that point, all items having a minimum bid will be awarded to the highest bid. Those individuals will be contacted the next week. For items that remain, the auction will then continue online Monday, February 27th through Sunday, March 5th. Those with the winning bids via the online auction will be contacted on the following week after bidding ends. The link to the auction will be posted on the Goshen High School Athletics website, Facebook page and Twitter. To see all of the items that are in the auction, please visit: athletics.goshenschools.org/redskinsauction. This is also the online auction sight, but bids will not be accepted until sometime on Monday, 2/27. Reminder to all wrestlers – We will have our end of the season meeting TODAY after school at 4:00 p.m. in the fitness room. Bring a bag to clean out your locker. All wrestlers are expected to attend! On Friday, the boys basketball plays Manchester for the final home game of the season. We will also celebrate Champions Together by introducing the Unified Track & Field team, as well as our guest basketball players from Special Olympics Indiana. Please attend to witness GHS receive their Champions Together banner at halftime of the varsity game. At the end of halftime, all students will get two slices of pizza from the Student Athletic Council for Fan Appreciation Night! To take advantage of this beautiful weather in February, the Ultimate Frisbee Club will be playing TOMORROW right after school on the administration field. You need forms on file before you can participate. You can get the required forms from Mr. Brubaker, Mr. Snyder or Mr. Lucas Kauffman. The Ultimate Frisbee Club and Key Club will be selling RedHawks bumper stickers during Friday’s boys basketball game at GHS. Stickers are weather-proof and removable, and are just $4 each! Cap & Gown Delivery Day – May 2nd during SRT. Join us on Thursday from 6-8:00 p.m. in the media center for financial aid information in Spanish. We will cover the FAFSA, scholarships from La Casa and hear testimonies from college students and community members. Dinner will be served! Come find out how you can apply for financial help for college. Please join us for a college visit to Ivy Tech in Elkhart on March 10th! This is first come, first serve as space is limited. Priority will be given to upperclassman. See Ms. Gomez (2370) or Mrs. Stamatovich (JAG) to pick up and turn in permission slips. Permission slips are due on FRIDAY! Seniors: If you still need to order a cap and gown you can visit their web site at www.highschool.herffjones.com to place an order. There will be a call out meeting TOMORROW during the 2nd session of SRT in room 1450 for anybody interested in IB or AP ART next year. Please attend to see what you could do. Students do NOT need to be planning to pursue a future in art to be in these classes. They are for all students who would like to take our top art classes at GHS for college credit. The JV boys basketball team defeated West Noble 52-20. Goshen shot 50% from the floor as a team. Leading the way in scoring was Dominick Swinney with twelve, Ben Bontrager-Singer with nine, Philip Wertz with eight and Joseph Good with seven. Wertz added four rebounds and Swinney five steals and three assists. The boys varsity basketball team won at home against West Noble 71-59 on Senior Night. The RedHawks were led by Mitchell Walters with a double-double including a career-high 31 points and 12 rebounds. Will Line also had a double-double with 13 points and ten assists. Eliot Nafziger added eleven points and CJ Detweiler eight points and six rebounds. Welcome back! We hope you enjoyed your long weekend. Reminder to all wrestlers – We will have our end of the season meeting TOMORROW after school at 4:00 p.m. in the fitness room. Bring a bag to clean out your locker. All wrestlers are expected to attend! Join us on February 23rd from 6-8:00 p.m. in the media center for financial aid information in Spanish. We will cover the FAFSA, scholarships from La Casa and hear testimonies from college students and community members. Dinner will be served! Come find out how you can apply for financial help for college. Super Mileage will meet at 7:00 a.m. and 3:40 p.m. on the following dates: February 21st and 28th. There will be a call out meeting during the 2nd session of SRT on Thursday in room 1450 for anybody interested in IB or AP ART next year. Please attend to see what you could do. Students do NOT need to be planning to pursue a future in art to be in these classes. They are for all students who would like to take our top art classes at GHS for college credit. The boys varsity basketball team lost to Westview 42-29. The team was led by Michael Pinarski with nine points and four rebounds. CJ Detweiler, Mitchell Walters and Will Line each added five points. Line dished out five assists. The boys JV basketball team’s six game winning streak came to an end on the road against Westview when they lost 36-31. The team was in scoring by Philip Wertz and Porter Revoir with nine points each. Brockton Yoder led the team in rebounding with eight. Joseph Good added four rebounds and three assists. The boys JV and varsity basketball teams will host West Noble. JV plays at 6:00 p.m., followed by varsity at 7:30 p.m. Good luck gentlemen! The 2017 GHS musical is Camelot, and it is another great production! The remaining performances will be held on March 16, 17, & 18 at 7:30 p.m. and March 19 at 2:30 p.m. in the GHS auditorium. Tickets are $10 for adults, and $8 for children/students K-12. If you email your order, please make sure you include which date/show you wish to attend the musical, how many tickets you need, and how many tickets are for adults or students. You may include seat or section preference; if the seats are available, they will be assigned to you. All ticket requests are given the best seats available according to the time they are requested, so plan now to get the best seats! Tickets will also be available at the door for most performances. The actors, pit orchestra, directors, set designers, light and sound designers, costume and make-up artists, choreographers, stage crew, publicity coordinators, and parents are all working hard to ensure that this production is another great show for our community. You will not want to miss it! REMINDER: We do not have school tomorrow or Monday. Enjoy the long weekend and we will see you on Tuesday! Universal Tamal is currently hiring part-time waiters/waitresses. You must be fluent in English and Spanish and be at least 17 years old. Please apply in person. This Saturday, the GHS band department is hosting a Winter Guard Invitational here at GHS. There will be 46 groups from around the state performing in the main gym from 11:00 a.m. to 6:00 p.m. Entry into the show is $6. The Goshen JV Winter Guard performs at 11:28 a.m. The Goshen Cadet Winter Guard performs at 2:19 p.m. and the Goshen Varsity Winter Guard performs at 5:06 p.m. Come out Saturday and support our awesome guard program! If you missed out on the first IUSB college visit, please join us for another! On March 2nd we will take students to IUSB to see the campus and learn about their college. See Ms. Gomez (2370) or Mrs. Stamatovich (JAG) to pick up and return permission slip forms. This is first come, first serve as space is limited. Due to ISTEP, sophomores cannot go on this trip. PERMISSION SLIPS ARE DUE TODAY! IHSAA Student-Athlete Tip of the Week: Super Bowl 51 was Tom Brady’s fifth title. His leadership and grit helped lead his team back from a 28-3 deficit. This game will no doubt seal Brady’s legacy as the best quarterback to ever play the game. However, Brady still realizes he is part of the team and not the team. When asked why there has never been any friction between him and his coach, Brady answers quite simply, “He’s the coach, I’m the player.” That simple philosophy is a quality that all athletes should take to heart. Do you listen to your coach? Do you let outside influences affect your attitude towards your coach? If your coach asks you to do something, do you abide? The most successful teams are those that believe in their coach and the system he/she runs! Please join us for a college visit to Ivy Tech in Elkhart! This is first come, first serve as space is limited. Priority will be given to upperclassman. See Ms. Gomez (2370) or Mrs. Stamatovich (JAG) to pick up and turn in permission slips. PERMISSION SLIPS ARE DUE FEBRUARY 24th! Seniors: IUSB will be here TODAY from 9:00 a.m.-1:00 p.m. for an onsite admissions visit. Have your application fee waived, qualify for a $500 scholarship and receive an admissions decision on the spot. Space is limited. Sign up in the guidance office ASAP! There will be a call out meeting during the 2nd session of SRT on Thursday, February 23rd in room 1450 for anybody interested in IB or AP ART next year. Please attend to see what you could do. Students do NOT need to be planning to pursue a future in art to be in these classes. They are for all students who would like to take our top art classes at GHS for college credit. The boys varsity swim & dive team will compete at Concord in sectionals at 5:30 p.m. Boys varsity wrestling will compete in state prelims at Banker’s Life Stadium at 6:00 p.m. Boys JV and varsity basketball will compete at Westview. JV plays at 6:00 p.m., followed by varsity at 7:30 p.m. Boys varsity wrestling will compete at state at Banker’s Life Stadium at 9:30 a.m. The boys varsity swim & dive team will compete at Concord in sectional diving prelims at 9:00 a.m., followed by sectionals finals at 1:00 p.m. Ambassadors who visit this Thursday, please meet Mr. Kissinger at the welcome center with your lesson plan immediately after 2nd period. If you missed out on the first IUSB college visit, please join us for another! On March 2nd we will take students to IUSB to see the campus and learn about their college. See Ms. Gomez (2370) or Mrs. Stamatovich (JAG) to pick up and return permission slip forms. This is first come, first serve as space is limited. Due to ISTEP, sophomores cannot go on this trip. PERMISSION SLIPS ARE DUE TOMORROW! Homework help is available every Tuesday and Thursday in the media center from 3:45-5:00 p.m. starting this week! A bus will be available around 5:20 p.m. if you need a ride home. It will pick you up at door M. This is a great opportunity if you just need a little extra time or even just a quiet place to do your homework at the end of the day. Seniors: IUSB will be here TOMORROW from 9:00 a.m.-1:00 p.m. for an onsite admissions visit. Have your application fee waived, qualify for a $500 scholarship and receive an admissions decision on the spot. Space is limited. Sign up in the guidance office ASAP! 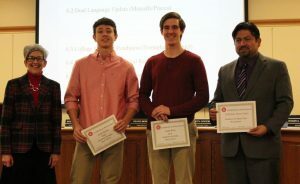 The February 13, 2017 board recognition was for Goshen High School student athletes who earned All-State honors in their fall sports. The athletes are pictured below with Superintendent Diane Woodworth and School Board President Felipe Merino. Tennis, Jacob Grewe-Academic All-State and Hugh Birky-Academic All-State. 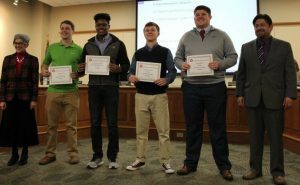 Additionally, Bobby Sessa and Simon Myers were awarded Honorable Mention Academic All-State honors, and the tennis team was also recognized as a team for Academic All-State honors. 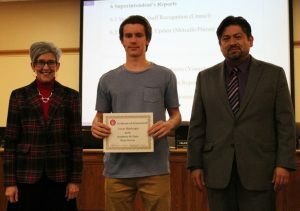 Boys Soccer, Lucas Bontreger-Academic All-State and 1st Team All-State, (not pictured) Chris Garcia-1st Team All-State and Marcos Hernandez-2nd Team All-State. Volleyball, Carly Gingerich-Academic All-State. Additionally, Jeana Born and Reagan Wilson were awarded Academic All-State Honorable Mention. Dr. Woodworth asked the parents of the athletes to stand, and thanked them for the support and encouragement of their students and of Goshen High School athletics. Thank you, student athletes, for your superb representation of Goshen High School and the Goshen community! Do you want free candy? 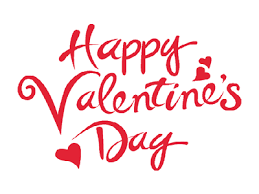 The first 50 people to make a purchase at each lunch on Valentine’s Day from the Red Zone will receive a FREE goody bag! Universal Tamal is currently hiring part-time waiters/waitresses. You must be fluent in English and Spanish. Please apply in person. If you missed out on the first IUSB college visit, please join us for another! On March 2nd we will take students to IUSB to see the campus and learn about their college. See Ms. Gomez (2370) or Mrs. Stamatovich (JAG) to pick up and return permission slip forms. This is first come, first serve as space is limited. Due to ISTEP, sophomores cannot go on this trip. PERMISSION SLIPS ARE DUE THURSDAY! Seniors: IUSB will be here on THURSDAY from 9:00 a.m.-1:00 p.m. for an onsite admissions visit. Have your application fee waived, qualify for a $500 scholarship and receive an admissions decision on the spot. Space is limited. Sign up in the guidance office ASAP! Hey Students – want to make up a credit or get ahead by taking an on-line class? Then Merit on the Move may be for you! Starting Wednesday and running approximately eleven weeks, you may take an after school class in our Apex Lab in room 1060. Sessions ONLY meet Wednesdays and Thursdays from 3:45-5:45 p.m., but work/athletic/music conflicts can be worked out. Only a limited number of spots are available, so please notify your Guidance Counselor ASAP if you are interested. Super Mileage will meet at 7:00 a.m. and 3:40 p.m. on the following dates: February 14th, 21st and 28th. There will be a callout meeting TODAY for Unified Track & Field in the main gym. If you are a junior or senior who is interested in helping with Prom there will be a meeting TODAY during the 2nd session of SRT in room 8080. For more than 90 years, The Scholastic Art & Writing Award program has sought to encourage, foster, and reward creativity in our nation’s classrooms and to confer recognition on emerging talent. Our region, which covers 18 counties, has participated for decades, beginning in the Tea Room of the former Robertson’s Department Store in downtown South Bend. L.S. Ayres hosted the exhibition until the South Bend Museum of Art became involved. The South Bend Museum of Art is now the affiliate for the Scholastic Art Awards’ Northwest Indiana and Southwest Lower Michigan Region. This region includes the following counties: INDIANA counties of Benton, Cass, Elkhart, Fulton, Jasper, Kosciusko, Lake, LaPorte, Marshall, Newton, Porter, Pulaski, St. Joseph, Stark, White; and MICHIGAN counties of Berrien, Cass and St. Joseph. The Scholastic Art Awards represents the most comprehensive national annual assessment of the creative spirit among American teens. Three core values have not changed since The Awards inception: freedom of expression, a blind adjudication process, and work criteria based on originality, technical proficiency, and emergence of personal voice. Students in seventh through twelfth grade submit digital images of their work, which is juried by more than 50 jurors solicited from the local arts and education community. A process of “blind adjudication” is used, whereby judging is determined on a merit basis with only the art object under review, without any knowledge as to student identity (gender, race, background, etc.). Jurors are instructed to select artwork that excels in 1) Originality, 2) Technical Skill, and 3) Emergence of a personal vision or voice. Approximately 5 – 7% of all regional submissions are recognized with Gold Key Awards and all are considered for national-level recognition. • Silver Key: Approximately 7 – 10% of all regional submissions are recognized with Silver Key Awards. 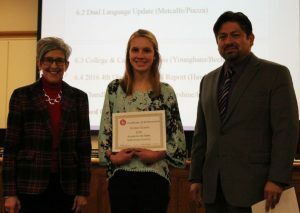 • Honorable Mention: This Award recognizes students with artistic potential. Approximately 10 – 15% of all regional submissions receive Honorable Mention Awards. Marine Biology students are reminded that the pre-trip seminars begin on Monday evening, March 13th and continue on Saturday mornings and Monday evenings until the trip. Your attendance at these pre-trip seminars is expected and so conflicts need to be worked out ahead of that time. If you have any questions, see one of the Weavers in room 3070. Goshen Animal Clinic is hiring a part-time kennel attendant for evenings, weekends and some holidays. Duties are cleaning cages, feeding/watering animals, taking dogs outside and keeping the general kennel area clean. Starting pay is $8.00/hr. You must be 16 or older. Please stop in and fill out an application at 2806 S. Main Street – next to Bethany High School. Seniors: IUSB will be here on February 16th from 9:00 a.m.-1:00 p.m. for an onsite admissions visit. Have your application fee waived, qualify for a $500 scholarship and receive an admissions decision on the spot. Space is limited. Sign up in the guidance office ASAP! Hey Students – want to make up a credit or get ahead by taking an on-line class? Then Merit on the Move may be for you! Starting February 15th and running approximately eleven weeks, you may take an after school class in our Apex Lab in room 1060. Sessions ONLY meet Wednesdays and Thursdays from 3:45-5:45 p.m., but work/athletic/music conflicts can be worked out. Only a limited number of spots are available, so please notify your Guidance Counselor ASAP if you are interested. There will be a callout meeting TOMORROW for Unified Track & Field in the main gym. If you are a junior or senior who is interested in helping with Prom there will be a meeting TOMORROW during the 2nd session of SRT in room 8080. The boys basketball team pulled out a victory against Wawasee 42-41. The RedHawks were led in scoring by Will Line with 17, CJ Detweiler eight, Mitchell Walters seven and Eliot Nafziger six. Walters also added eight rebounds and Michael Pinarski dished out five assists. The RedHawks won their final conference game against a 13-win Wawasee team. After being tied at halftime the Hawks pulled away in the 2nd half to win 48-37. The team had balanced scoring and was led by Dominick Swinney with 13 points, Philip Wertz ten, Porter Revoir ten and Eric Newell nine. Swinney and Brockton Yoder also contributed four assists and four rebounds each while Wertz contributed five rebounds and four steals. The boys freshman basketball team defeated Concord 38-35 in the last game of the season. Bryant Grewe led the Redhawks with ten points, Jason Holmes added nine and Zack Barker eight. The boys freshman basketball team lost in the second round of the Freshman tournament to Northridge 38-32. Do you want free candy? The first 50 people to make a purchase at each lunch from the Red Zone will receive a FREE goody bag! Goshen Animal Clinic is hiring a part-time kennel attendant for evenings, weekends and some holidays. Duties are cleaning cages, feeding/watering animals, taking dogs outside and keeping the general kennel area clean. Starting pay is $8.00/hr. You must be 16 or older. Please stop in and fill out an application at 2806 S. Main Street (Next to Bethany High School). SENIORS: Do you need help filing the FAFSA? This Sunday, February 12th is College Goal Sunday at sites across the United States. Get FREE help from financial aid professionals on how to file your FAFSA to meet the March 10th deadline. There are several local sites in Elkhart and South Bend, but our local site is Goshen College from 2-4:00 p.m. in the Union Building. Spanish translation is available. You must set up your FSA ID to log in to certain websites and access your personal information from the US Government, but it must be done a few days before you actually file. Go to www.collegegoalsunday.org for exact information on what you need to complete the FAFSA! Do not miss this opportunity to benefit from the money available to you and your family if you qualify! Homework help is available every Tuesday and Thursday in the media center from 3:45-5:00 p.m. starting next week! A bus will be available around 5:20 p.m. if you need a ride home. It will pick you up at door M. This is a great opportunity if you just need a little extra time or even just a quiet place to do your homework at the end of the day. IHSAA Student-Athlete Tip of the Week: College basketball is getting close to tournament time, and one of the best mid-majors in the country, Illinois State, has relied on good defense while standing atop the Missouri Valley Conference, according to their coach Dan Muller. Defense is important in all team sports. It’s often been said that defense wins championships. Muller has been quoted as saying, “The key has been on defense. We aren’t afraid to call each other out if one of us gets beat.” Defensive accountability is an important part of team success. When a teammate fails to do their part, there’s a right way to point out a weakness or slip up. If you must call out a teammate, do so in a positive way. It’s how you deliver the message that will either inspire your teammate or have a negative effect on the entire team! The Goshen Band Boosters are hosting a shoe drive from February 10th through April 9th and would love your help! They’re collecting gently used or new shoes which are then taken to other countries such as Haiti and given to micro-entrepreneurs. The entrepreneurs refurbish the shoes into usable ones or other items of use and sell them to earn an income to help themselves and their families. Take a look in your closets or wherever you may keep your shoes and see if you have a pair or two that you would be willing to donate. You can even donate flip flops. Bins will be placed around the school (as well as the Goshen area) that have a poster on them with the dos and don’ts of what is an acceptable shoe. If you would like more information, or have any questions please feel free to contact Kristy Nissley at nissley1998@gmail.com. Thank you for your help! There will be a callout meeting for Unified Track & Field in the main gym on Tuesday, February 14th. Any junior or senior who is interested in helping with Prom – There will be a meeting on Tuesday, February 14th during the 2nd session of SRT in room 8080. The boys JV and varsity basketball teams will host Wawasee. JV plays at 6:15 p.m., followed by varsity at 7:30 p.m. Boys varsity wrestling will compete in Semi State at the Allen County Coliseum at 8:30 a.m. The boys freshman basketball team will play in the freshman tourney at 9:00 a.m. at Heritage Intermediate. Reminder: Parent/teacher conferences are TODAY from 4:00-8:00 p.m.
All GHS girls soccer players need to sign up ASAP to work concessions TOMORROW for the boys home basketball game vs. Wawasee. Sign-up sheets are on the teachers’ lounge door. Youth Council will have their first meeting TODAY in the main gym during the 1st session of SRT. Stay In Bounds Ambassadors will meet in the main gym TODAY during the 2nd session of SRT to plan for next week’s visits. All Ambassadors are expected to attend. Notify Mr. Kissinger in advance if you have a conflict. The second meeting of the Teen Health Club will be TODAY during the 2nd session of SRT. We will meet in Mrs. King’s office, so come to Guidance and they can direct you. We will work on planning some health education booths for this spring. We will also talk about connecting with Goshen Health personnel related to health careers. We hope you can join us! The boys freshman basketball team will compete in the freshman tourney @ Elkhart Memorial at 6:00 p.m. Good luck gentlemen! Goshen High School leadership is aware of the current social media rumors and the rumors are not true. The safety and well-being of our students is our top priority. When we become aware of alleged concerns for our students, we investigate to learn the facts and communicate with students and families when necessary. In our social media culture, rumors can go viral without the knowledge of the facts. We ask that the current rumor not be replicated or shared. For those who have shared the rumor, we ask you to remove it from your social media accounts. The students of our district are experiencing many good things in and out of the classroom this year. We should focus on their many positive accomplishments. The students of Goshen deserve the best we can offer as they learn, grow and live into their future. We value the partnerships we have with families, and the trust they have in us as we provide exceptional educational opportunities for all students across our district. Goshen Community Schools is committed to Inspiring Innovation, Empowering Potential and Enriching our World. La directiva de Goshen High School se ha enterado de los rumores en las redes sociales actuales. Los rumores no son ciertos. La seguridad y el bienestar de nuestros alumnos es nuestra máxima prioridad. Cuando nos enteramos de presuntas preocupaciones respecto a nuestros alumnos, investigamos para conocer los hechos y nos comunicamos con nuestros alumnos y con sus familias cuando es necesario. En nuestra cultura de redes sociales, los rumores pueden volverse virales sin tener el conocimiento de los hechos. Pedimos que el rumor actual no sea repetido ni compartido. Para aquellos que han compartido el rumor, les pedimos sacarlo de sus cuentas de redes sociales. Los alumnos de nuestro distrito están experimentando muchas cosas buenas dentro y fuera del salón de clases este año. Debemos centrarnos en muchos de sus logros positivos. Los alumnos de Goshen se merecen lo mejor que podamos ofrecerles mientras aprenden, crecen y se preparan para su futuro. Valoramos las alianzas que tenemos con las familias y la confianza que tienen en nosotros, ya que proporcionamos oportunidades educativas excepcionales para todos los alumnos de nuestro distrito. La Corporación Escolar de Goshen se ha comprometido a inspirar innovación, a empoderar el potencial y a enriquecer nuestro mundo. Reminder: Parent/teacher conferences are TOMORROW from 4:00-8:00 p.m.
All GHS girls soccer players need to sign up to work concessions on Friday, February 10th for the boys home basketball game vs. Wawasee. Sign-up sheets are on the teachers’ lounge door. The GHS French Club is hosting a Valentine’s Dale Sale! Tell a friend or other loved one how much you care with a Valentine’s bear and card for $4. You can make your purchase in the commons during lunch TODAY. Deliveries will be made to SRT on Valentine’s Day. Any sophomore or junior interested in visiting the Career Center on Thursday, February 16th can pick up a permission slip in the guidance office. Youth Council will have their first meeting TOMORROW in the main gym during the 1st session of SRT. Stay In Bounds Ambassadors will meet in the main gym TOMORROW during the 2nd session of SRT to plan for next week’s visits. All Ambassadors are expected to attend. Notify Mr. Kissinger in advance if you have a conflict. The second meeting of the Teen Health Club will be TOMORROW during the 2nd session of SRT. We will meet in Mrs. King’s office, so come to Guidance and they can direct you. We will work on planning some health education booths for this spring. We will also talk about connecting with Goshen Health personnel related to health careers. We hope you can join us! The JV boys basketball team beat Lakeland 52-22. The RedHawks were led in scoring by Dominick Swinney, Brockton Yoder and Ben Bontrager-Singer with 13, 12 and 11 points respectively. Bontrager-Singer had nine rebounds and Philip Wertz six. Joseph Good and Wes Beck each had four assists. The boys varsity basketball team won 51-29 against a Lakeland team that had won four in a row coming into the game. The RedHawks were led in scoring by Will Line, CJ Detweiler and Mitchell Walters with 15, 10 and 8 points respectively. Michael Pinarksi and Walters each pulled down seven rebounds to lead the team in the category.